I made this costume for San Diego Comic-Con several years back. My friend Bethany wanted to enter her Queen Amidala gown in the Masquerade, so my other friend Julie and I both made matching Handmaiden costumes to be her escorts. Our trio of Queen Amidala and Her Handmaidens won the "Most Beautiful" trophy in the competition, against 51 other entrants. We were number 50 out of 52 and had to follow a giant robot act - Optimus Prime. Needless to say, Queen Amidala took home the trophy. She spent HOURS and HOURS just on creating the beaded panels in her gown. This costume was relatively quick and simple to make. 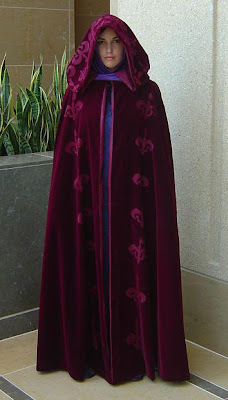 The robe is velvet, with the pattern stamped into the velvet. Bethany's husband carved the block stamps (in three sizes) which Julie and I both used to make identical cloaks. I lined up and pressed the stamps onto the velvet (prior to sewing the velvet to the lining). 2. Lay the stamp on an ironing board or table with the stamp facing up. 3. Lay your velvet on top of the stamp with the velvet side against the stamp pattern (wrong side up), lined up where you want it placed. Secure your fabric (if necessary) so it will not slide around. *Do not slide the iron around because you do not want the fabric to slip. If you need to move the iron to cover the entire stamp, gently lift the iron straight up, then move it and press straight down. *Be careful not to press the corners of your stamp block - you do not want to leave corner imprints in your velvet. This is what the costume looks like under the cloak. The dark blue sleeves are actually half circles attached at the shoulder seam - looks pretty cool from the sides. I covered the slipper shoes (house shoes found in Chinatown) with the same dark blue fabric. It stretches so I just hand-sewed it over the shoes. 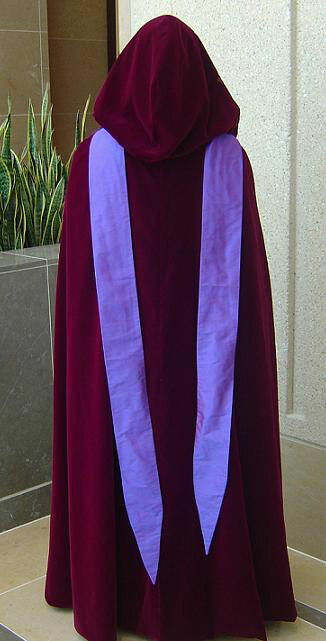 The underdress is cheap polyester flag material - has a nice sheen but I wish we used a light cotton or linen instead. The hood/scarf is silk. This is by far the hottest costume I have ever worn. By hot, I mean IT DOESN'T BREATHE! 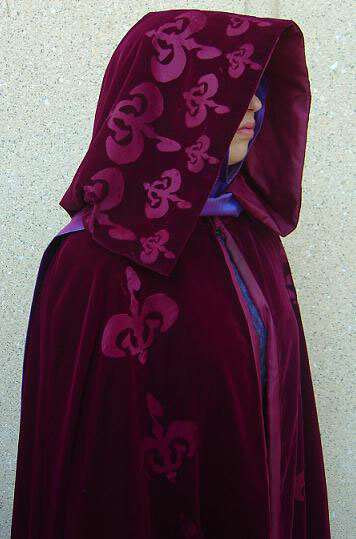 Dupioni silk headscarfs and polyester velvet cloaks are sweatering. Needless to say, this costume doesn't come out of the closet much. I think the only time I wore it besides Comic-Con was for the Sci Fi Museum Hall of Fame inaugeration of George Lucas, Neil Gaiman and Anne McCaffrey. dumb question how did u create the design for the stamp? carve? custom made? love 2 know. also wht pattern did u use for the undergown. i can't seem to find one that wrks. The light blue undergown is just a T-tunic. The dark blue is a T-tunic with the sides cut symmetrically. The crushed velvet sleeves are just half-circles; half-diameter is the length of your arm from armpit to fingertips. Actually that's a bad link, you need a thicker block, not just a sheet of linoleum. You need a thick block; carve maybe at least twice as thick as the velvet pile. Well you can see the three sizes in the photos. The big stamp was used on the front, the two smaller pieces stamped on the hood. The blocks themselves were probably an inch thick, the stamp piece carved maybe half a centimeter deep. Maybe a hand-span wide, plus? I don't really know, I haven't seen them in years.